AP PGECET 2019 Certificates Verification, AP PGECET 2019 Web Based Counseling Dates: Post Graduate Engineering Common Entrance Test (AP PGECET) is AP State Level Common Entrance Test for admission into Regular PG Courses in Engineering, Technology, Pharmacy (ME / M.Tech./ M.Pharmacy ), Graduate level Pharm-D (Post Baccalaureate) for the academic year 2019 - 2020 conducted by JNTU, Kakinada on behalf of A.P. State Council of Higher Education (APSCHE), a statutory Body of the Government of A.P. 1. Commencement of online applications: ..-03-2019. JNTU, Kakinada has published the AP PGECET 2019 notification in the month of March, 2019 and the JNTUK would be invited the Online application from the eligible candidates for appearing the post graduate engineering common entrance test 2019 for admission into ME/ MTech/ MPharm / MArch/ Graduate level Pharm D Full Time in University and Affiliated Engineering / Pharmacy Colleges in Telangana State for the academic year 2019-2020. The candidates who were applied for this entrance exam stream, they were appeared the entrance exam, which was held from ...-05-2019 to ...-05-2019 and the JNTUK declared the PGECET results on May ..., 2019. APSCHE, Hyderabad would give the AP PGECET 2019 Admissions web based counseling Detailed notification. AP PGECET 2019 Certificate Verification, Web Based Counseling Dates: The GATE qualified and eligible candidates of 2019 and 2019, GPAT and PGECET qualified and eligible Candidates of 2019 to be attended the AP PGECET Web Counseling for admission into M.E./ M.Tech./ M.Arch / M.Pharmacy/Pharm.D (P.B.) courses for the academic year 2019-2019 as per the schedule given below at any one of the Help Line centers. 1. Candidates are informed that they should satisfy the admission rules prescribed in the related G.O. besides satisfying the eligibility criteria of the respective universities and should be prepared to pay the tuition fee as applicable. 2. The left over seats after allotment for GATE / GPAT Candidates are alone available for AP PGECET candidates. 3. This notification itself is a call for counseling. No separate call letters are sent to the individual candidates. 4. Mere attending counseling does not guarantee a seat. 5. Candidates have to pay non-refundable processing fee of Rs.1000/- SC/ST candidates and Rs.900/- for others at the time of certificate verification. Candidates Claiming NCC can attend at JNT University, Kakinada only as per the Schedule. a) Class work commences from ....2019.
b) Candidates claiming NCC/CAP/Sports/PH have to attend for certificate verification at any one of the following Helpline Centres only as per the schedule. However, they shall exercise web options on the dates mentioned above against their rank. 1. Administrative Block, JNTUA, Anantapuram. 2. University College of Engineering, JNTUK, Kakinada. 3. SRR & CVR Govt. College, Vijayawada. 4. Acharya Nagarjuna University, Guntur. 5. AU online counseling center, Opp. School of distance education, Andhra University, Visakhapatnam. 6. SV University, old MBA Building, Tirupati. 1. 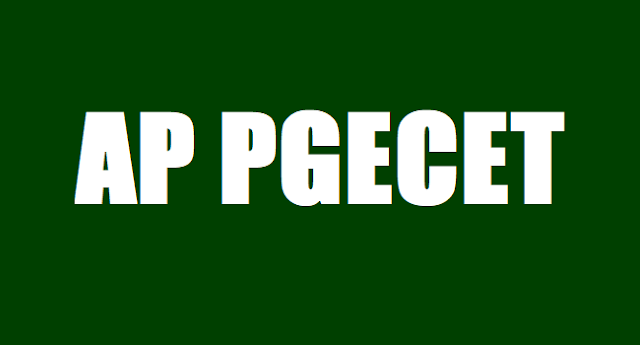 GATE Score / GPAT /AP PGECET Rank Card & also AP PGECET Hall Ticket. 2. Degree Certificate & Memorandum of marks of qualifying Examination. 3. Memo of SSC or its equivalent. 5. Residence certificate for preceding 7 years of the qualifying examination i.e. Graduation in respect of candidates who have private study without any institutionalized education. 6. Integrated community certificate issued by the competent authority in case of BC/SC/ST candidates. 7. Residence Certificate of father or mother for a period of 10 years in Telangana/A.P. excluding the period of their employment outside Telangana/A.P. from M.R.O. in case of candidates who studied outside the state of Telangana/AP. candidate can verify nearest helpline center, or verify at only their particular help line center. I qualified gate in 2016, but not applied for pgecet. Am i eligible to attend the counseling? when will appgecet 2016 2nd counciling starts? does the Appgcet Certificate Verification Started?